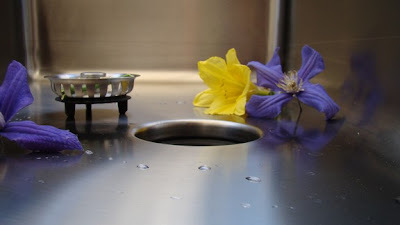 Last week, I wrote a quick piece about about the Affluence seamless sink. Within hours of that post's going live, I received a very thoughtful e-mail from Dan Sullivan. Dan Sullivan is the inventor of the seamless sink and he's also the CEO of Affluence, the company who brought the seamless sink to market. Dan gave me his phone number and asked me to call him, so I did. What followed was an hour-long conversation with a man whose passion for his invention is contagious, let me tell you. What an inspiring story and what a great human being. Dan walked me through Affluence's website and we reviewed everything, sink by sink. 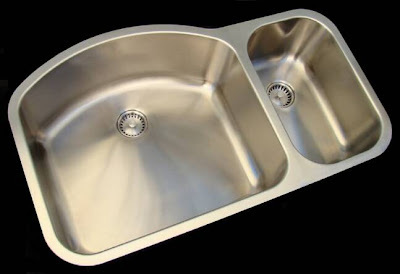 When I wrote about the Affluence originally, all I saw was the streamlined look of a seamless sink. Granted, it's an impressive feature, but it's only a third of the story. All disposers have a clunky black stopper. In a double bowl sink, which is what most people have, there's a strainer basket on the sink side and stopper on the disposer side. Because that's the way thing just are, no one thinks that they don't coordinate. At least I never did. 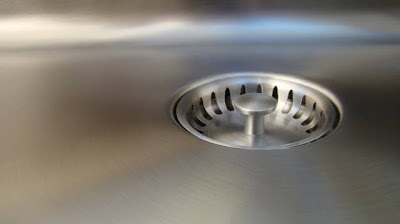 But in an Affluence sink, the strainer and the stopper are identical. They're identical because the drain opening and the disposer opening are the same size. Brilliant! It makes the already improved appearance look even better. See what I mean? Now go look at your sink. If you have a double bowl set-up, take a look at how bad your stopper looks. Awful, isn't it? As I'm showing here, there's help available. The final third of the story is how the Affluence seamless sink re-thought the act of disposer installation. Plumbers hate installing disposers. It's a labor-intensive exercise that invariably ends in bleeding knuckles. But watch this video as Dan himself installs a disposer on an Affluence sink. All of the parts for this installation come with the sink too, so there's nothing extra to buy. Again, brilliant! I understand completely why the Affluence Seamless Sink won the Best of Competition Award at KBIS this year. And Dan, you made a believer out of me.